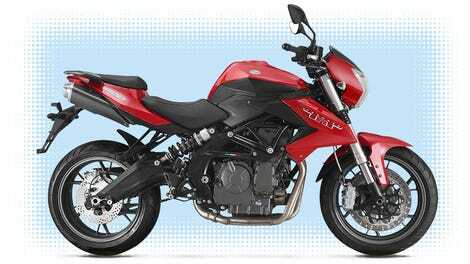 The Benelli TNT600 is an Italian-branded Chinese-made naked upright sport motorcycle. Its power-to-price ratio is pretty excellent. It’s also a little lumbering and oddly bulbous. It’s a lot of bike for the bucks and it’s a lot of bike in general. This motorcycle is covered in Italian flags and “Since 1911” markings because the brand was started by a band of Italian brothers more than 100 years ago. A member of that same family started a firearms business, but that’s the only connection between these bikes and Benelli boomsticks. Today the company claims an HQ in Pesaro, Italy but manufactures the TNT600, TNT300 and TNT135 near Shanghai, China along with its Caffenero 150 and Zaffenero 250 scooters. The short answer is that the overall build quality feels fine, on both this and the TNT300, which I also rode and will talk about another time. But there were aspects of the machine that seemed a little off. The TNT600 is designed to be, in the words of its marketeer, “an outlier” in price and performance. 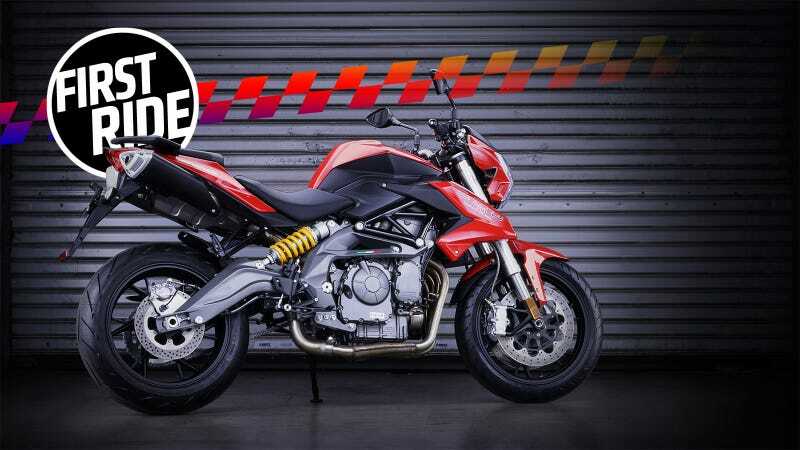 Its inline four-cylinder engine makes a claimed 67 horsepower, whereas a rival like the Honda CB500F (which also costs about $6,000) only has 50 HP. Relatedly, the 67 HP Kawasaki Z650 costs almost $1,000 more. And both of those only have two cylinders a piece. But there’s a lot more to performance than engine output. Benelli says the TNT600 weighs a hulking 485 pounds (not 509.2 pounds as I was originally told, but still heavy), while Honda’s CB comes in at 414.4 and the Kawasaki I just mentioned is only 410.1 per Benelli’s own research data. I haven’t ridden either of those rival bikes so I can’t tell you how much lighter they actually feel, but I don’t think it’s overdramatic to call 70 plus pounds a colossal delta in this context. The Benelli still has a ratio advantage, but both bikes will have to take a corner eventually, and when that happens, I’d trade power for lightness for sure. That said, Benelli also claims its machine tops out at 137 mph while the Honda and Kawasaki can apparently only pull 115 and 120.5 respectively. Not that you would ever consider testing those figures on the road, right? I will say I appreciated the TNT600’s upright riding position (until it got windy, more on that later), but the idea of making a small motorcycle feel like a big motorcycle seems backwards to me. I’ve never ridden a 500 or 600cc motorcycle that felt awkwardly undersized, and I’m a lanky six-foot tall. I have ridden 1000cc motorcycles that I didn’t like because of their substantial heft. Compactness and chuckability is one of the biggest selling points of the 600cc class. Intentionally oversizing the machine seems counterintuitive. Unless you really like the idea of riding a fast highway sport bike without the price or death-prescribing power. In that case, the TNT600 is pretty much perfect. In spite of its mass, TNT600 definitely rips to safe highway speeds and beyond in satisfyingly short order. Its straight line acceleration is not terrifyingly intimidating but it is fun as hell. The machine sounds good, too. Real good. The 600cc engine is basically two parallel twins fused together and it produces a throaty rasp that’s distinctive and present without being obnoxious. In real-world riding, the bike feels fast. And it’s very stable when it’s cruising at speed. But the ride’s not as smooth as I would have expected from something with a four cylinder engine; once you’re over 50 mph your rear-view mirrors are basically blurred to oblivion. Naked bikes are always blustery, and the TNT600 is no exception. Even with my gut laid out on the gas tank, my Bell modular helmet was blasted with a constant and intense wind gust once I was riding north of 70 mph. The little plastic deflector over the headlight is mainly for looks, then. The bike’s on the wide side for comfortable lanesplitting, too. And once you start carving canyons the machine’s size and weight distribution really starts to seem annoying. I’ll admit that I didn’t get to do much riding beyond highway slogging and slipping the clutch through parking lots, but any situation that involved quickly adjusting the bike’s direction didn’t feel particularly comfortable to me. I already mentioned that the TNT600’s build quality is acceptable, and as far as the sturdiness of material that’s true. At least, as far as I could tell in one day of riding. I also got to observe that the plastics stand up fairly well to being dropped, but I won’t call anybody out for dumping it. The responsiveness of the controls was a little bit of a letdown, though. The shifter and both brake pulls have to be moved a long way to get any action out of them. This motorcycle doesn’t want to do anything in a hurry, which might actually be advantageous for a new rider, but will be frustrating if you’re used to machines built to tighter tolerances. Climbing off the TNT600 and back onto my 10-year-old Yamaha, which I’ve only taken OK care of, felt like advancing into the future because the clutch, brakes and shifter just seemed so much snappier on my own WR250R. So if you’re thinking about a Benelli or a used bike that cost a lot more a few years ago, that might be worth thinking about. Since this class of motorcycle is always going to be shopped against used hardware, I asked Benelli’s people to tell us exactly why we might want a TNT600 over something from a more established brand with a few miles on it. The response was pretty straightforward: Benelli offers a 12 month, 12,000 mile warranty, the peace of mind that you’re not getting something pre-crashed, and buying from a dealer gives you the benefit of having financing options. New riders who want a bike that’s going to feel exciting without being pants-soilingly scary would probably really dig the TNT600. Despite its weight it’s a forgiving motorcycle that would be pretty easy for almost anyone to ride while still having some performance headroom to keep you amused as your skills improve. This bike’s best trick is highway merging and stability at speed, almost like a miniature execution of the meteorically quick (and galaxy-sized) Suzuki Hayabusa. So to get super specific: If you like the idea of a ’Busa but prefer sport naked styling and don’t mind going half as fast for half the money, the Benelli TNT600 is worth checking out.. The first bullet point in Benelli’s list of selling points is: “More powerful than everything with comparable pricing.” Indeed, the TNT600 has got a lot of energy and you’ll know it when you give it a squeeze. But I wouldn’t describe it as an exceptionally precise machine, and if aggressive handling is your priority you might be better off looking at something lighter than this. But at the end of the day the TNT600 has got enough juice to be entertaining, at least for a little while, no matter who’s riding. Not intimidating or hard to learn. It's got speed, but it's not tight enough to be elite.